I have a confession to make. I don’t know if I want to admit it or not because it’s a little bit embarrassing. I’ve done this often, but I think today might have broken a record on how many times I’ve done it in a row. I think I have a problem. Today, I washed the same load of clothes for the 3rd time in a row. Maybe it was the 4th; I’m not certain. You see, I don’t do laundry every day. 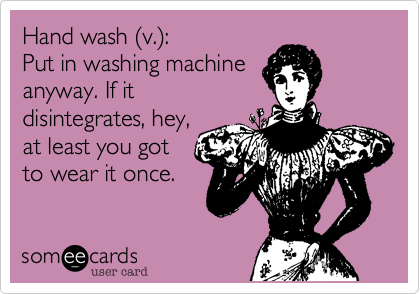 Usually I do it about 2-3 times a week, so that means I have several loads to wash. Having another load is what reminds me to take out the previous and put it in the dryer. Regardless of how never-ending the laundry seems to be, at some point I do reach a final load. And trust me, when that moment happens I can almost hear the trumpets sound and hear the choir singing Alleluia! Wednesday was that day for me. I finished all my washing and drying except for a blanket and a couple of towels that had accumulated over the past day or so, and it was going to be the last of this process that seems to have no end. By Friday evening I realized that stuff was still sitting in the washer. Oops. I ran it through another time with plans to get them to the dryer right after they were done. Fridays are the days where the week catches up with me. My body and mind are both exhausted. I don’t want to cook, but I don’t want to get dressed cute and go to dinner, so it inevitably ends up being a pizza night. 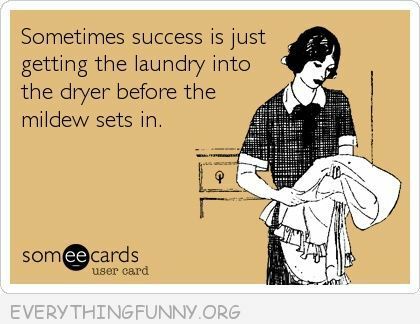 *sigh* I went to sleep Friday with dishes piled up in the sink and on the counter, papers and clothes strewn all over the place, and unfolded laundry still sitting in the dryer while the blanket and towels were doing all but fermenting in the washer. I didn’t care. I knew putting that load in the dryer meant I had to take those out and either have a pile of clean clothes sitting on my unvacuumed floor or actually fold, hang up, and put them away. So I went to sleep without giving it a second thought. I may or may not have remembered these clothes yesterday. It was a beautiful day out, and the weather has had a mind of its own lately, so I took advantage of it (thank goodness since it’s been sleeting all day here today after people were literally laying out by the pool yesterday). I dedicated the entire day to the kiddos, and the majority of it was spent outside. Those clothes were the last thing on my mind, so I really have no idea if I ran them through again or not. 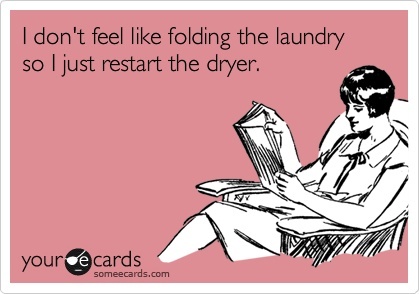 I’m not sure what’s worse, the fact that I kept forgetting to put those in the dryer or the fact that when I did remember, I didn’t want to take them out because that meant I had to fold the clothes that were still in the dryer from last week. You’ve just got to understand, when I finally get everything put away, it feels like I’m superwoman and just destroyed the last of the bad guys, and I can finally sit and relax. I don’t want to have to do it all over again just yet. Here I am today, though, and we don’t have clothes. Well, let me just be completely honest with you. We don’t have any clean underwear and socks. That means it’s time to wash. Unfortunately, I opened the washer to start the first load and realized, oops, those things were still in there from Wednesday. This time I used a little extra detergent just in case, and I hear that the washer has stopped, so it’s time to move on to the reds. The kids have school tomorrow, and their uniforms are red, so I can’t put that off any longer. Here’s to hoping I remember to take the final load out so I don’t wash them more than once this week. And here’s to hoping I get everything folded and hung up tonight before I go to sleep. Please, someone tell me I’m not the only one who does this. Or maybe you have another similar thing you do that’s just not talked about very often. Spill it. What do you want to admit to? 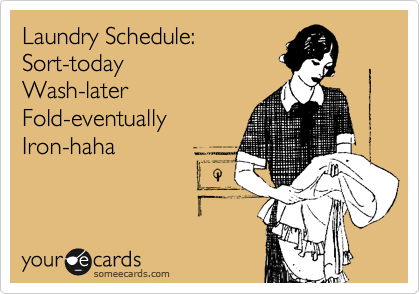 For fun, I’ve added some laundry funnies that really express my true feelings about the subject.